On this page we set out an example of how to prepare for a meeting with your MP, and the an example of a letter to an MP. These are just examples, just one way to approach communicating with your MP. You may have your own way of doing this but, if you do not and want some guidance, then why not simply use these examples for yourr meeting or letter - or those parts that reflect your personal views about this issue? The documents can be downloaded if you want to copy them or get busy with some serious 'cut n pasting'! NB: These documents provide an excellent and comprehensive starting point from which to understand and summarise the PJM case. If you telephone your MP's constituency office you will be given a 15 minute slot to meet up with your MP - that is probably all the time you have. Our problem with the PJM issue is that it is massive. It is impossible to cover all the points in 15 minutes, but it is possible to 'be forearmed', summarise the key issues, provide some background data to show you have done your research, and then during your meeting cherry-pick the items that are most appealing to your MP. Here are the notes that were used by Barry Fleming to brief one MP (not his own, as it happens). They consist of 11 pages of Summary together with a number of supporting documents. the problems arising from civil servants who trade in myths and folklore. If you have 15 minutes to spare, why not visit your MP and take copies of these papers with you? 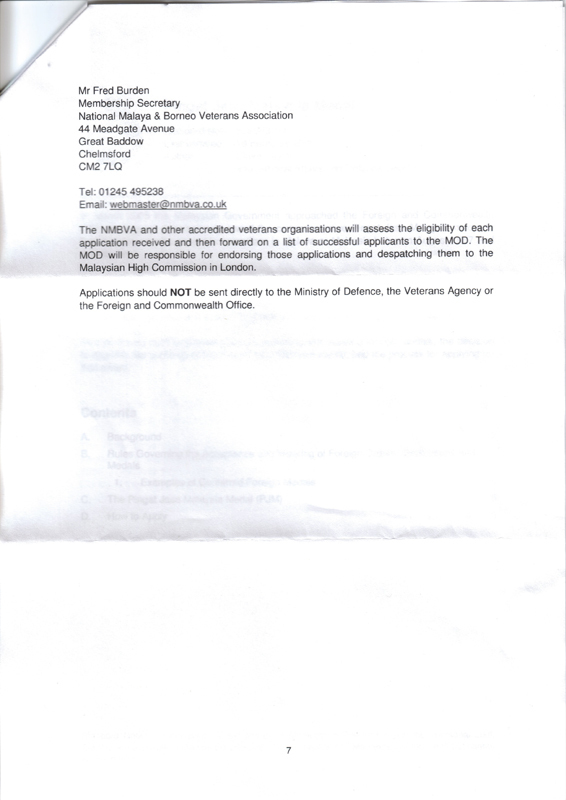 Letter from Mark Harper, Shadow Veterans Minister, addressed to the wrong 'Fleming'! 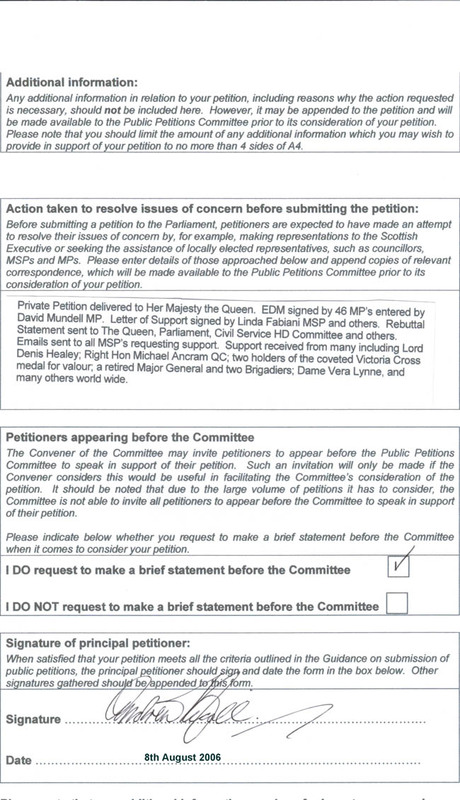 Scottish Petition Summary , Page 1, Page 2.
and Part B page 1, Part B page 2. Commons Library Standard Note SN/IA/3914 re: PJM, p1, p2, p3, p4, p5, p6, p7. 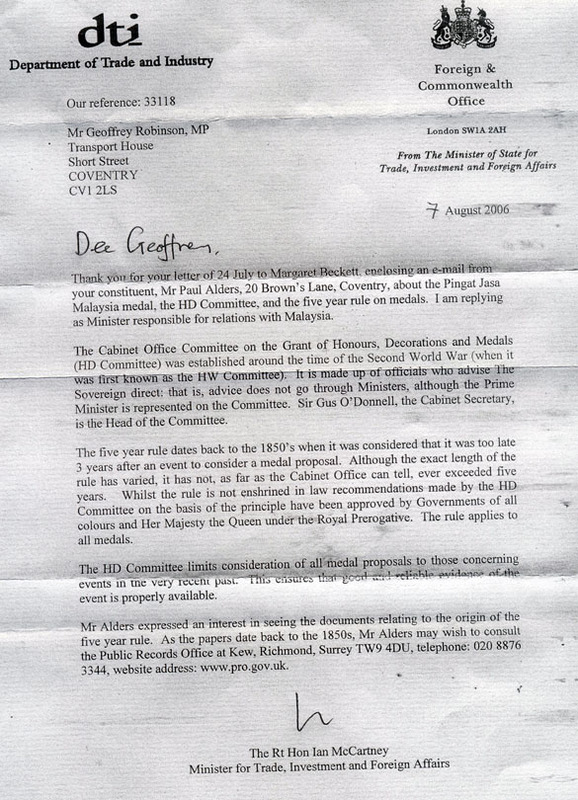 This is just one example of a letter written to an MP. It was the one that was used to present the updated We Ask 50 Questions submission. 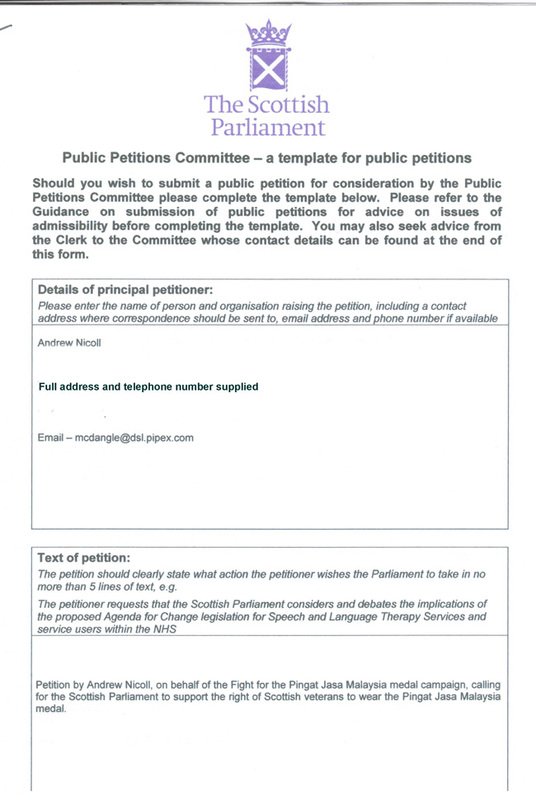 In these letters we endeavour to point our MPs at the more significant issues knowing that they will have a very short attention span unless we say something meaningful that they can use. 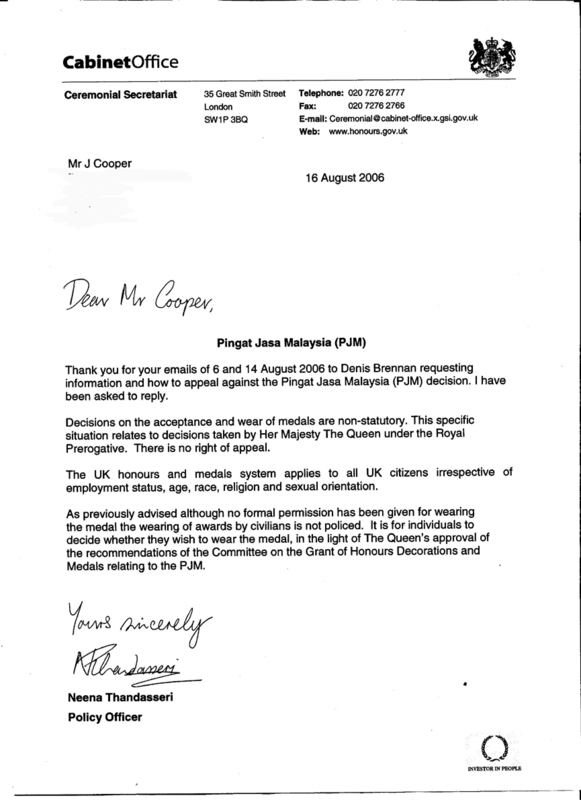 This letter will probably test even this MP's focus, but he is interested in our cause and, being an ex-serviceman, he will understand the finer points about our view of the way we and the PJM are being treated. The best advice is keep it short and keep it accurate. This is not a good example of the former, but it is of the latter. Thank you for your continuing support and for asking for my further submission regarding our fight for the right to wear the PJM which you I hope you will judge appropriate to present to the Minister. It is enclosed herewith. 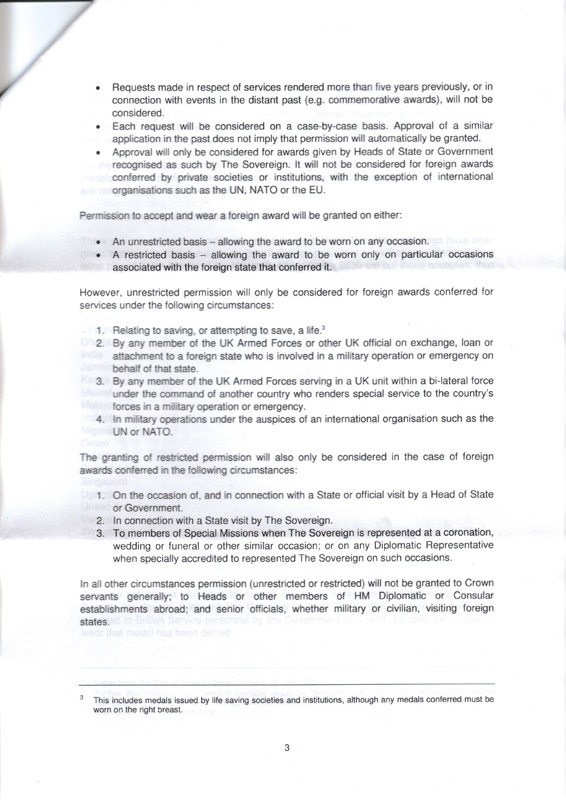 Formal permission for us to do that has been withheld on erroneous grounds. We believe there is no tenable argument for that restriction to continue. 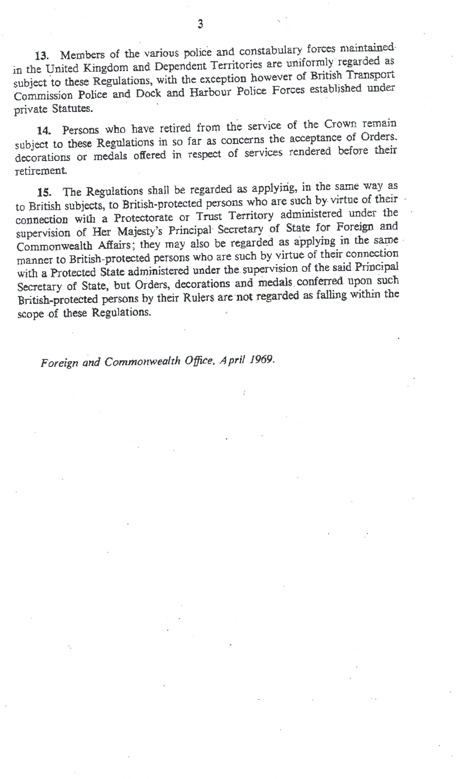 We also believe that it is inappropriate for the British Government to have insisted upon different eligibility criteria for the British. 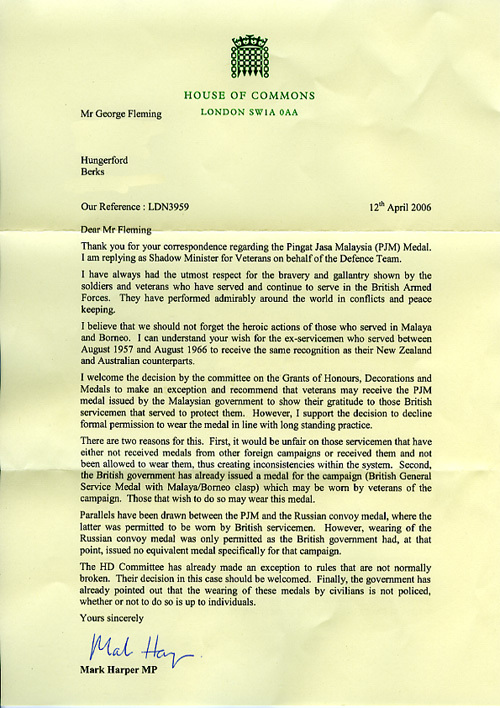 It is our view that the HD Committee made a recommendation based upon an incorrect briefing of the double-medalling situation and, encouraged by the support they thought they had from that objection, proceeded with an inappropriate and inflexible application of the 5-year rule to a 2004 Commonwealth service medal that was not made uniquely to the UK and had been accepted by the other Commonwealth countries by the time the HD Committee sat to consider their recommendation. 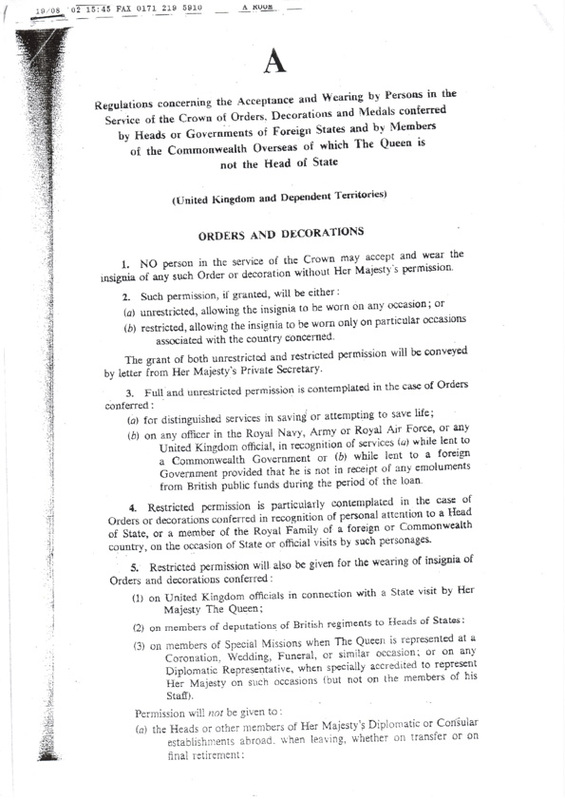 British Foreign Decorations Rules provide for the 5-year Rule to be applied to the effect that “Requests in respect of services rendered more than five years previously, or in connection with events in the distant past (e.g. 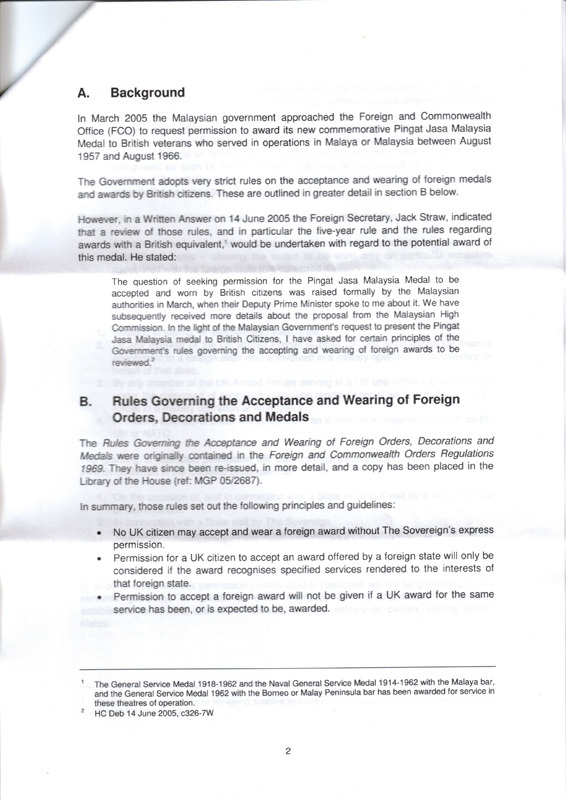 commemorative awards), will not be entertained” - but the PJM offer was ‘entertained’ and so at outset could not have been judged to have fallen foul of the 5-year rule. If it had, the Government would have diplomatically said ‘No’ at outset. 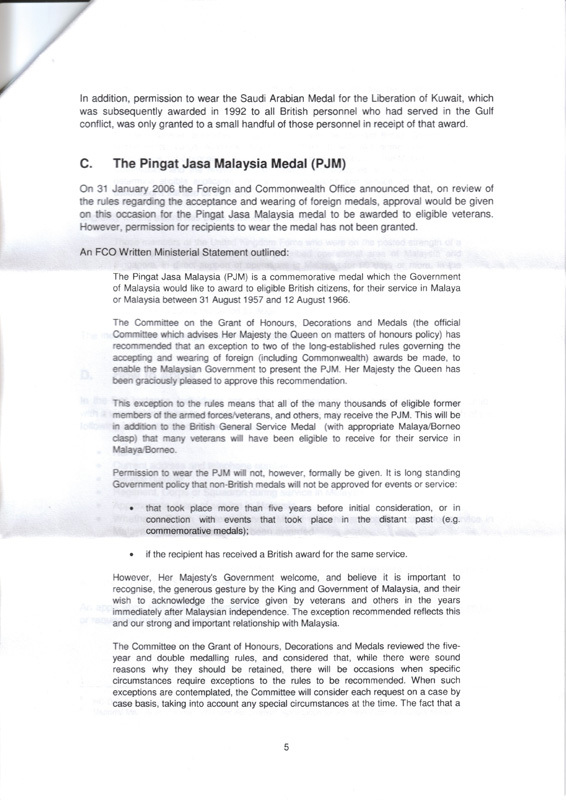 The Double-medalling point was an issue raised by the MOD by way of objection to the PJM but for 5 ½ years in Singapore and 1 ½ years on the Peninsula, no British medal was offered. Without taking into account the true scope of the PJM, it is clear that double-medalling was always a fallacy and the HD Committee should have been briefed accordingly. 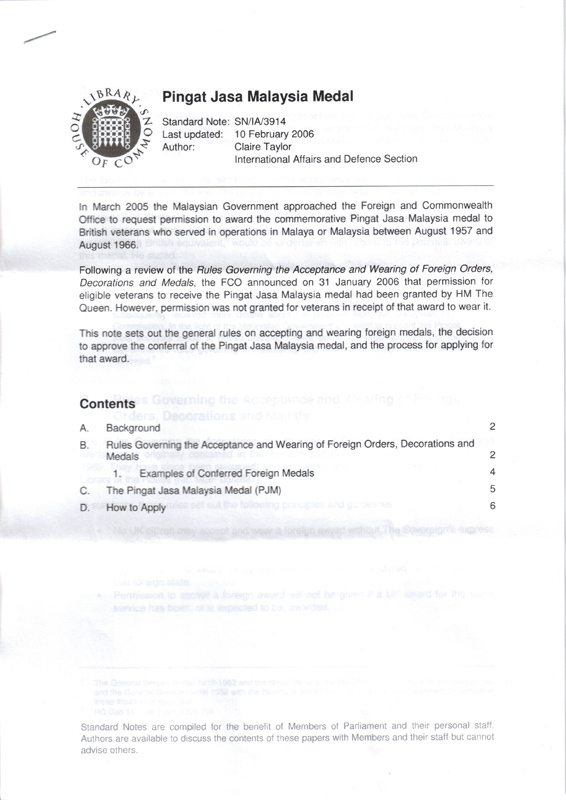 The Ministerial Statement and other statements made subsequently rely upon the combination of both the double-medalling and the 5-year rule objections. 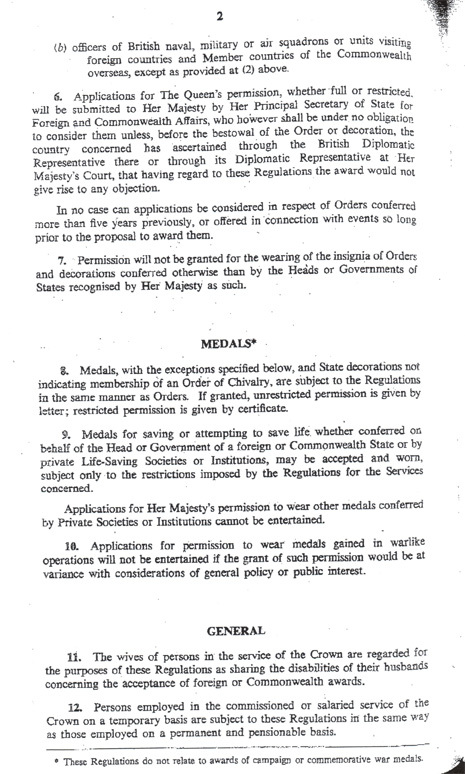 Without the prop of the former, the objection to the PJM must fail because the medal cannot be rejected on grounds that did not exist at outset (see 1. above). We live in a global, inter-dependent, world. 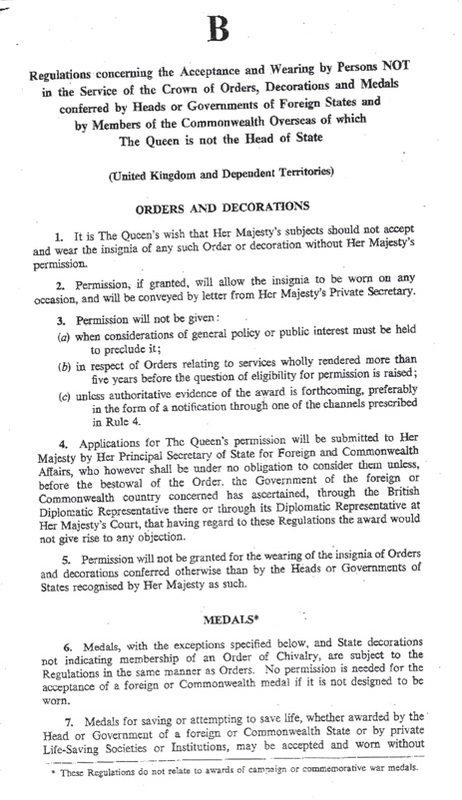 The UK should not use its singular Imperial Honours System to discriminate against any of the eligible Commonwealth citizens of the multi-nation Commonwealth to whom the offer was made. 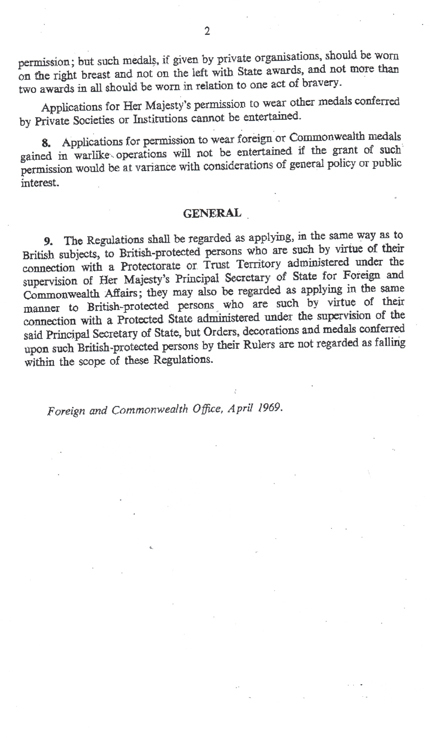 The fact that it is a Commonwealth offer should have obviated any one country making an idiosyncratic and discriminatory decision. But that is exactly what has happened. 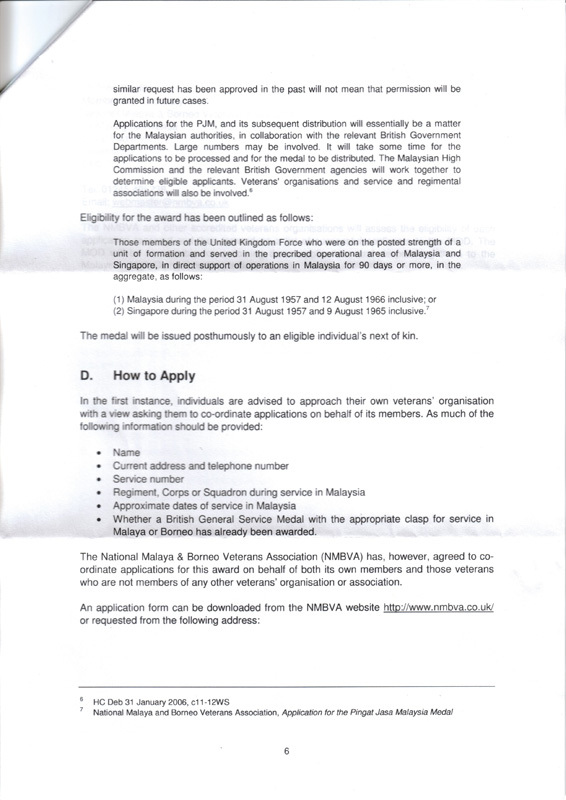 Furthermore, the British Government should not have used the intervening year to insist that the Malaysian Government change the eligibility criteria solely for British citizens. 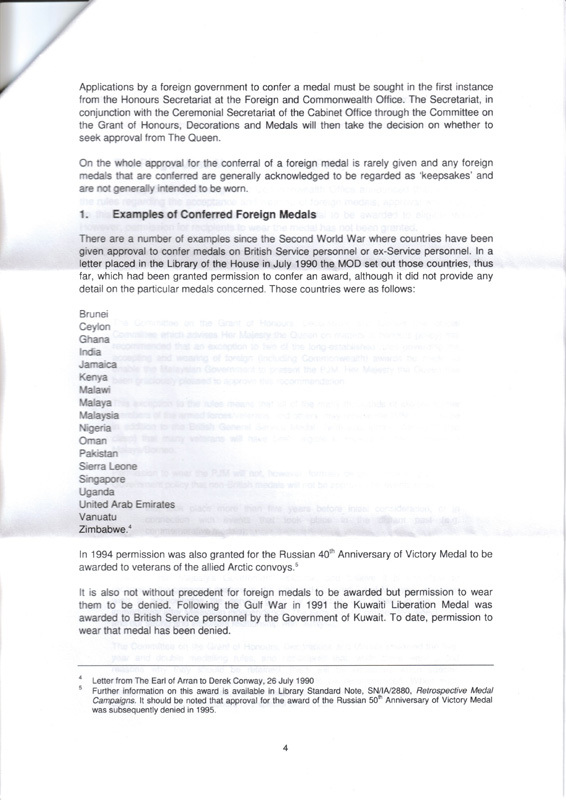 We also take great exception to the Cabinet Office letter I received (attached to the submission) that states that the wearing of the PJM “would compromise previous awards and the integrity of the system.” We do not think the Russian medals in respect of ‘Patriotic’ wars and medals in respect of other anniversaries would be prejudiced by a medal that represents a vigorous and successful campaign against terrorism. Our Victoria Cross holders and other supporters do not think so either. Confusion abounds in the HD Committee and in Government who were poorly briefed. Frankly, I do not think the decision makers gave the PJM the time it deserved for proper consideration and that is why I believe there is an opportunity now for appropriate words to be found to enable the PJM to be worn - particularly for ageing civilian veterans. Any other result will be shameful, mean-minded, and inappropriate. I very much hope that you will be able to consider our submission and extract from it the points to put to the Minister. In the meantime, I hope you will visit our web site at www.fight4thePHM.org where all these points are addressed.